today’s status report will be about some major features and changes we added in the last couple of months due to feedback from our internal alpha testers. We will conclude this report with a short preview for the upcoming month. We’ve made changes about how the actions Guard and Reaction-Fire work in order to make them more flexible and versatile. Guard reduces damage while Reaction-Fire allows attacking a spotted enemy during its turn. In the past, executing one of those actions would have ended the current turn resulting in loss of unused AP (action points). So it made no difference using Guard with 3 AP or 1 AP left besides wasting precious AP. On the other hand, Guard increased defense (DEF) by a certain percentage. Therefore units with a lower defense value gained an overall smaller advantage from using Guard than heavily armored units. Reaction-Fire was too powerful because the number of attacks possible wasn’t capped. AP cost had been increased to 2 AP in order to somewhat balance this action, resulting in decreased usage (especially for enemy AI). Now both actions consume at least 1 AP while still ending the current turn. 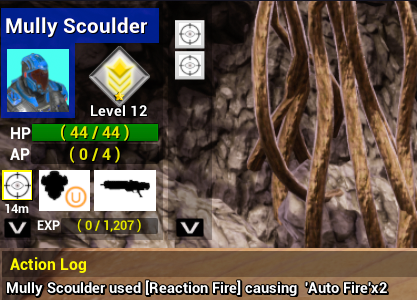 A consumable effect (Guarding or Auto-Fire) will be provided for the amount of AP left when activating the action. If a unit has 2 AP left and activates Reaction-Fire, 2 (different) enemies can be attacked before the action wears out. Activating Guard with 3 AP left results in a stack of 3 Guarding effects being applied.Critical hits will be reduced to normal attacks while there is a 33% chance to evade none-critical hits. One effect will be consumed in both cases (and irrespective of success). Right now multiple effects won’t be combined into a stack however we will implement this soon. In addition, stackable effects are required for further features like injuries, damage- or heal-over-time effects. While covered the chance to be hit as well as area damage will be reduced as long as the unit in a cover isn’t flanked.Until now the area providing area wasn’t clear. It was hard to say from which position an enemy could circumvent the cover. You are always covered in an angular range of 180°. A blue arrow represents the center of this range and provides some sort of orientation (also check picture). Since it’s still hard to tell where the effective cover ends we will implement a visualization of the complete cover area in the future. A purely cosmetic improvement also applies to covers. Parts of a cover can be fired off if a target in cover has been missed. Before recent changes, you could move freely inside movement distance radius (blue circle). Occasionally this resulted in large routes being traversed inside this area, something that felt awkward and didn’t make much sense at all. Now, the movement is restricted by a maximum path length per movement action. The attribute MOV (movement) determines the maximum length of the route in meters. Avoiding obstacles now reduces your overall movement. Hence the attribute now gained a broader importance resulting in a greater diversion of the unit classes. Of course, you can still try different routes inside the distance radius, which right now only provides an orientation of maximum straightforward route. 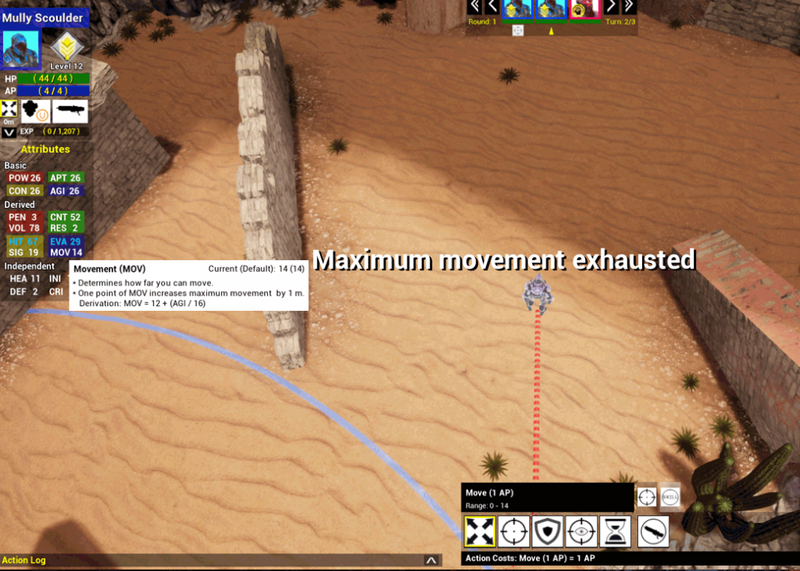 Manual adjustment of movement path through individual waypoints is also still possible. Each of the five player-controlled classes now has its own voice set. In addition humanoid and robotic enemies also have their (in comparison reduced) voice set. At the moment voices will be used only for basic situations like attacking or being hit. Acquiring and implementing this voice-package is the first step in increasing the atmosphere. In-game voices will be replaced by a customized and extensive voice package in the future. Damage from attacks is determined by a rock–paper–scissors system. Three damage types are facing three corresponding armor types. Each damage type is effective (150% damage), neutral or weak (50% damage) against a certain armor type. 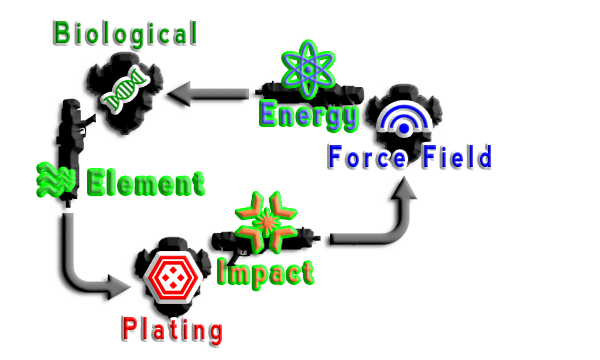 For example, the damage type Energy is strong against Biological armor, weak against Plating and deals normal damage against Force Field. At the request of our testers, we have implemented an indicator for attack-actions. It shows if an attack deals extra, normal or reduced damage to the current target. 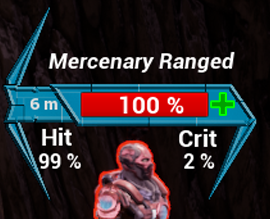 In order to avoid checking action tooltips to get a clue, we added that indicator to the action bar (left) and to the target display (right). Attack indicators are represented by a “+” for strong and “-” for weak attacks just as the corresponding action-log entries. The demo mission map gained some improvement. Besides visual enhancement like adding vegetation and improving some cliffs, we increased the number of covers considerably (different types of cactus, see blog main picture). 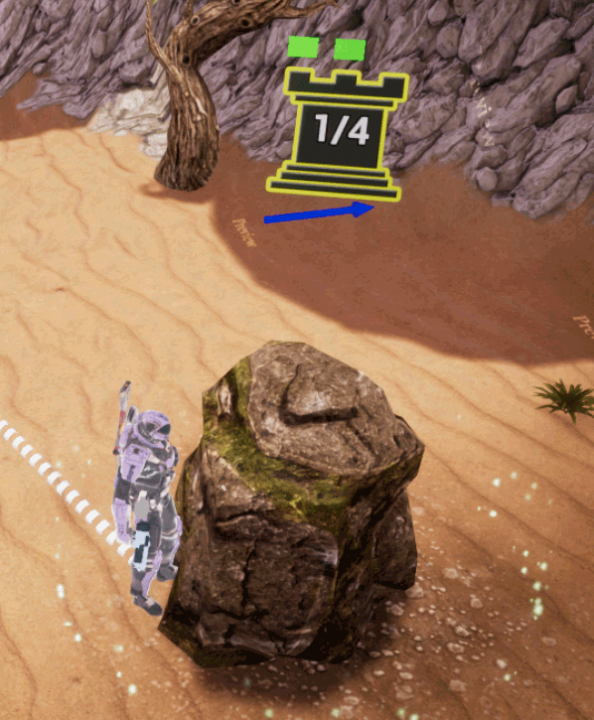 We also added two new interactive level elements, a deployable ramp and bridge. These represent unlockable shortcuts adding more diversity to the current map. Concluding today status report we want to provide a brief summary of the upcoming months. Since the end of our internal alpha test, we are working hard on publishing the demo. This is a major goal for us because we don’t want to wait until Early Access in order to receive and include critic, ideas and suggestions from the gamers. Therefore you will be able to download and play the demo in the upcoming quarter and getting an idea of our current development progress. We would be very happy if you want to take part and joining the Eternal Escape community. After publishing the demo one of our goals is to complete the remaining game mechanics. The tactical gameplay which is a considerably large part of the game is ~75% completed. In the curse of the year, the demo will be updated several times to reflect our current progress. Feature and enhancements suggested by the community can also be added to the demo long before Early Access begins. Though the current demo is quite advanced in terms of game mechanic, most of the assets (textures, models, animations, sounds etc) used are only placeholders. Those are borrowed from several free marketplace packages and example project and have to be replaced by our own creations step by step. Creating this huge amount of assets is also an important step we will start to accomplish this summer. The mission map only demonstrates core game mechanics. The map won’t be present in the final game. Parts of the actual game can only be played during Early Access, so no potential spoilers until then. We are looking forward to your feedback and interest.